Call it the “anti-Kindle,” call it the “world’s largest book,” or call it “really hard to read,” there is no disputing that the expansive tome etched on over 700 stone slabs surrounding Myanmar’s glittering Kuthodaw Pagoda form a volume that would test even the most ardent book lover. 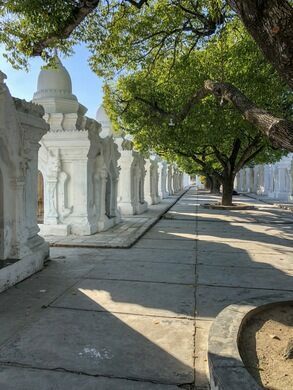 The Kuthodaw Pagoda was built 1857 by King Mindon Min. The gorgeous temple building is completely gilded on the exterior, giving it the look of a solid gold spectacle. However the true spectacle lays within the stark white stupas that surround its base. Beneath the pinnacled roofs of the squat little structures are 730 marble tablets (729 contain body of the text, while the 730th tablet describes their creation) covered on both sides with dense script. Taken all together, these comprise the entirety of Theravāda Buddhism’s religious canon, its tipitaka (a phrase meaning “three baskets,”which is a reference to the baskets in which the original Buddhist teachings were held). The thick stone tablets each stand over five feet tall and five inches thick. When the tablets were unveiled in 1868, each line of writing had been filled with golden ink and the stones were decorated with precious stones including rubies and diamonds. Unfortunately after the British invaded in the mid-1880s, the troops looted the temple site, stripping the slabs of their gold ink and gems. However today the sprawling book still stands, and the writing has been refilled with simple black ink so that while the opulent glory may have disappeared, the messages of the writings themselves live on for future generations. It might not be light reading, but it is assuredly enlightening. A vast, otherworldly collection of Buddhist stupas. The largest statue in the world towers at 420 feet high atop another 66 feet of pedestal.